The markets are no longer swinging wildly in response to escalations in the trade war — but there’s still a lot of risk in stocks, Allianz Chief Economic Adviser Mohamed El-Erian says. On Tuesday evening, the Trump administration announced that it is preparing another round of tariffs on Chinese goods worth $ 200 billion. On Wednesday, the Dow slumped just 170 points — less than 1%. That’s because Wall Street is betting that the tariffs are just part of a broader strategy, explained Mohamed El-Erian. Allianz’s chief economic adviser warned that the administration’s aggressive approach isn’t easily won. 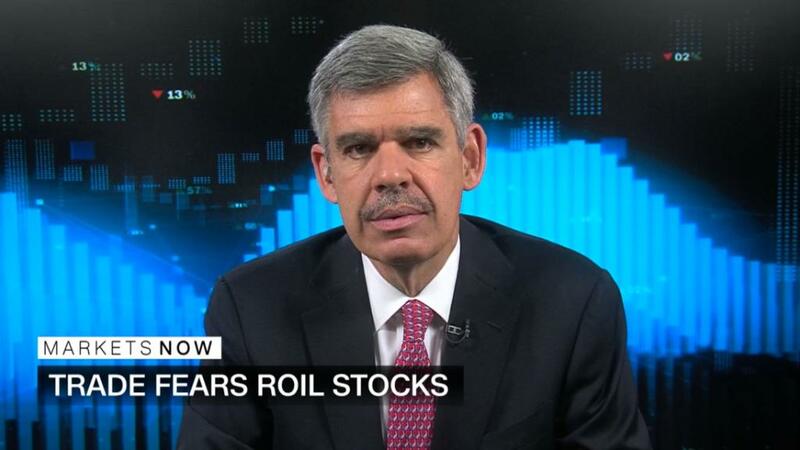 Ultimately, El-Erian believes the United States could benefit. “The US will be less damaged than other countries in a full-blown trade war,” he said. It may even be better off than before the trade battle, he said. El-Erian said that companies reporting earnings may report an increase in production costs because of tariffs. But we’re unlikely to hear that the trade actions have lowered demand, he said. The investing expert added that Trump’s abrasive approach to disruption is akin to disruption in the tech industry. CNNMoney’s “Markets Now” streams live from the New York Stock Exchange every Wednesday at 12:45 p.m. ET. Hosted by Quest, the 15-minute program features incisive commentary from experts. Recent guests include BlackRock’s R (BLK)ick Rieder, Stifel Chief Economist Lindsey Piegza and bitcoin bull Mike Novogratz.